You are going to Watch Cardcaptor Sakura Episode 59 English dubbed online free episodes with HQ / high quality. Stream Anime Cardcaptor Sakura Episode 59 Online English dub Sakura, Tomoyo, and the Ball Trap, Sakura grows in power for every Clow Card she transforms, while Yukito/Yue’s energy begins to falter. Syaoran, in the meantime, has fully realized his love for Sakura and consults with Tomoyo, who helps him deal with his jealousy towards Eriol and gives him the confidence (just barely, though) to speak his mind to the oblivious Sakura. Before he can do so, however, both he and Sakura sense Clow Reed’s presence once again, this time in the form of a basketball that leads them through the school at night. Space has been warped in the building, causing every door to lead into a different room each time, which separates her from Tomoyo. 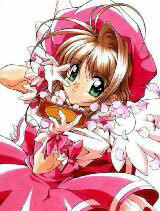 She begins to lose hope of finding her, but Syaoran gives her the courage to proceed. Sakura then hears Tomoyo’s singing voice and uses the transformed Shadow card to track her down. She later thanks Syaoran for all the help he has ever given her; Syaoran tries to confess his love to her, but is interrupted when Kero forces Sakura to pose with him for Tomoyo’s camera.